Sonata Bay, an Active Adult community in Berkeley NJ. Call 732-616-6226 for an appointment to see active adult community homes in Sonata Bay. Sonata Bay is a Over 55, Active Adult community in Berkeley, Ocean County, NJ. This quiet community is located near Route 9 and the Garden State Parkway. Nearby are the pristine beaches of the Jersey Shore. Additionally, boating,fishing, and swimming are all minutes away. Sonata Bay has a homeowners association, thus there’s a monthly HOA fee. But, as a result someone else cuts the grass, not you! When you combine low HOA fees and reasonable taxes, it’s a desirable place to live. In addition, there’s a parking lot for your RV or boat. Furthermore, your pets are welcome here. Construction started in Sonata Bay in 1990. Plus, there are more than 300 homes. Five basic models were available. The homes have either 2 or 3 bedrooms, and 2 or 3 baths. In addition, there’s a 1 or 2 car garage. Additionally, some homes have a loft, others have sun rooms. Homes generally are 1500+ to 2700+ square feet. The Sonata Bay clubhouse is the social center of the community. And, there are plenty of amenities to keep yourself occupied. When it’s hot, swim in the outdoor pool. Additionally you’ll find there are clubs, trips and social gatherings. Enjoy local activities such as fishing, boating, dining and more. Also, there’s an exercise area so you can stay in shape. 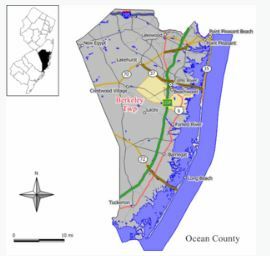 Ocean Ride provides bus transport in Ocean County. One service provides non-emergency medical transport to seniors. Advance reservations are necessary., however a fee is charged. Additionally, there are 12 local bus routes to key destinations. To either buy or sell a home in Sonata Bay, contact us. Call Bunny and Art Reiman – the Active Adult Community Specialists. Looking for info on recently closed homes in this community?